Editor’s note: Passport to Cheese is Cheese Market News’ feature series exploring the dairy industries of nations around the world. Each month this series takes an in-depth look at various nations/regions’ dairy industries with coverage of their milk and cheese statistics and key issues affecting them. The nations’ interplay with the United States also is explored. We are pleased to introduce our latest country — India. MADISON, Wis. — With all types of milk combined, India is the largest milk-producing nation in the world. 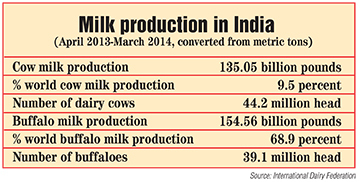 Production has been rising every year for the last several decades, and in 2014-15 total milk production reached 146.3 million metric tons (322.5 billion pounds), according to India’s ministry of agriculture. The country has grown both its cow milk and buffalo milk production. According to the International Dairy Federation’s (IDF) World Dairy Situation 2015 report published earlier this year, India produces 9.5 percent of the world’s cow milk, ranking third behind the combined European Union (first) and the United States (second). India is the leading producer of buffalo milk, accounting for 68.9 percent of the world’s production. IDF also reports India is the world leader in butter and other milkfat production (butteroil, ghee, etc.). “Today the market is largely dominated by India, which alone contributes almost half (47 percent) of the global production after outpacing Europe only a decade ago and doubling its volumes since then,” IDF notes in its World Dairy Situation report. Amul Dairy, run by India’s major dairy cooperative, notes that more than six decades ago, income from milk was undependable, and farmers, who derived most of their incomes from seasonal crops, often faced starvation during off-seasons. The milk marketing system was controlled by contractors and middlemen, and farmers were forced to sell their milk for low prices. Milk producer cooperatives began to form in the 1940s, and in 1955, the first modern dairy plant to process buffalo milk was built with support from the government of India, UNICEF, the government of New Zealand and the Food and Agriculture Organization of the United Nations (FAO). India’s National Dairy Development Board (NDDB) was founded in 1965 with the goal to transform dairying into an instrument for the development of India’s rural communities. In 1970, NDDB launched a dairy development program known as “Operation Flood” that extended 26 years and worked to develop India’s dairy infrastructure, connecting milksheds with urban markets and providing support for dairy cooperatives across the country. NDDB reports that 15.4 million farmers now are members of village dairy cooperatives. FAO published a 2009 report on smallholder dairy development in Asia that says while Gujarat Cooperative Milk Marketing Federation (GCMMF), known for its Amul brand, is acclaimed for its cooperative model, there is a perception that cooperative organizations generally have failed in other parts of India where organizational structures differ and the cooperatives are more government bodies than farmer representatives. A new National Dairy Plan – Phase I (NDP I) has been implemented as a multi-state initiative through 2019 to help increase milk productivity and production to meet India’s rapidly-growing demand for milk and help provide rural milk producers with greater access to the organized milk processing sector, NDDB says. NDP I will focus on 18 major milk-producing states which together account for more than 90 percent of the country’s milk production. GCMMF with its Amul brand accounted for more than 15 percent of India’s dairy market share in 2015, while Mother Dairy, which operates under NDDB, had a market share of more than 10 percent, according to Ruchit Mahendru, research consultant-food division for global market research and consulting firm TechSci Research. According to TechSci Research, drinking (fluid) milk in India, which holds the majority market share among dairy products, is projected to grow at a compound annual growth rate (CAGR) of more than 9 percent from 2016-2021 in value terms. India’s butter market also is projected to grow at a CAGR of around 9 percent, while the cheese market is expected to have a CAGR of more than 20 percent during 2016-2021. “Value-added dairy products such as butter and cheese have tremendous growth in the country given the change in consumer preferences and change in lifestyle and increasing inclination toward Western food products,” Mahendru says. TechSci Research reports that overall, the dairy products market in India experienced a CAGR of around 5 percent in value terms from 2011-2015 and is forecast to have a CAGR of more than 7 percent from 2016-2021. Despite its projected growth, Mahendru says India’s cheese market is largely untapped. Demand for cheese is projected to increase as a result of rising disposable income, changing food preferences, high urbanization and other factors. Cheese also is a major ingredient in Western foods such as pizzas and pastas that are gaining popularity. The major types of cheeses produced in India include Mozzarella, goat cheese and flavored Gouda cheeses such as chili, basil, pepper and garlic, Mahendru says. The highest demand is for Mozzarella and Gouda, he adds. Dairy exports from India are in-demand but not significant due to high domestic consumption, Mahendru says. However, skim milk powder exports are emerging as India’s largest segment after its government lifted bans on exporting this product. Overall, India exported more than $60 million worth of dairy-related products in 2014-2015, according to TechSci Research. Major dairy imports to India include ice cream, butter, cheese and milk powder, Mahendru says. India imported more than $15 million worth of dairy products in 2014-2015, mostly from France, Germany, Thailand and New Zealand. The United States does not export dairy products to India due to sanitary and phytosanitary (SPS) requirements imposed by India since 2003. According to the 2016 National Trade Estimate Report published by the Office of the U.S. Trade Representative (USTR), India insists on religious and cultural grounds that dairy products be derived from animals that have never received any non-vegetarian feeds. Despite reaching agreement on many issues during talks that began in 2010, India declined a U.S. offer to certify that dairy cattle were fed 100-percent vegetarian diets for up to 90 days prior to production, impeding progress on dairy exports. The United States and India restarted technical discussions on animal health issues, including dairy, in 2015, and USTR says the United States will continue to seek market access for U.S. dairy products in India during ongoing discussions.